Lands' End's Women's Faux Fur Hooded Down Winter Long Coat Selected As One Of This Year's Oprah's Favorite Things | Lands' End, Inc.
DODGEVILLE, Wis., Nov. 20, 2018 /PRNewswire/ -- Lands' End announced today that the Women's Faux Fur Hooded Down Winter Long Coat is included in this year's Oprah's Favorite Things holiday gift list featured in the December issue of O, The Oprah Magazineand on OprahMag.com. The Oprah's Favorite Things annual list is a must-have holiday shopping guide that features the most decadent desserts, ingenious gadgets, and finest finds in home, fashion, and beauty. The Women's Faux Fur Hooded Down Winter Long Coat will be available for purchase through landsend.com, our standalone retails locations, our catalog, and in the Oprah's Favorite Things storefront on Amazon at amazon.com/oprah or on the Amazon App anytime, anywhere. New this year, shoppers will also be able to shop the list via shoppable video content streaming from their Amazon Fire TV devices by opening the Amazon Shopping App on their Fire TV device and selecting Oprah's Favorite Things to browse video content. As Oprah says in the December issue of O, The Oprah Magazine, "Water-resistant on the outside, down on the inside, a removable faux-fur-trimmed hood, deep pockets—and you can wear these maxi coats without feeling like you've been swallowed whole. This is the coat of the season!" 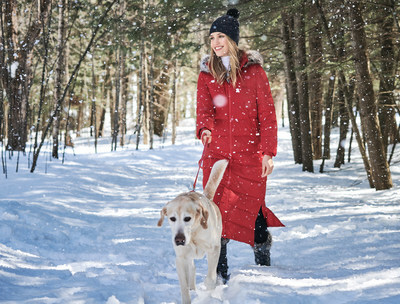 The Women's Faux Fur Hooded Down Winter Long Coat is designed for ultimate warmth, with a temperature rating of negative 45 degrees to 13 degrees Fahrenheit and 600 fill power down that keeps you warm without adding extra weight. The winter coat features HyperDRY™ down that retains its warming power even when wet, an inner storm flap that blocks wind and rain, removable and adjustable hood with a faux fur trim, and more. It's also 100 percent machine washable, comes in three fashionable colors, and ranges in size from Women's Regular, Petite, Tall and Plus, starting at $219. Twelve lucky readers will have the chance to win every item, including the Women's Faux Fur Hooded Down Winter Long Coat, on Oprah's Favorite Things List in the 12-Day Give-O-Way Sweepstakes (www.oprah.com/12days), which runs from November 28 through December 9. One additional winner will have the chance to win all 107 items with the Instant Win Code (www.oprah.com/instantwin18) found in the magazine kicking-off on December 10 and ending on December 14. The December issue of O, The Oprah Magazine, featuring the Women's Faux Fur Hooded Down Winter Long Coat on this year's list, hits newsstands nationwide on November 20.